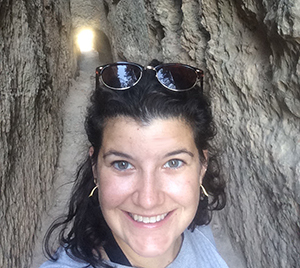 Samantha Lash is a doctoral student in Archeology, while also a master’s student in Earth, Environmental, and Planetary Sciences (DEEPs) through the Open Graduate Education Program. The combination of the two fields is unusual at first glance. The specific “language” and methodologies used in each field are very different. But to Lash, this unique and unusual combination is opening doors and catalyzing connections that may have not been otherwise possible. “The Open Grad program allows you to become literate in different fields because you are constantly interfacing with a different peer group on their terms,” says Lash. In order to make the combination work, Lash had to gather a good grounding in paleoclimatology and geochemistry, subjects she did not have a background in before stepping foot in the DEEPs program. “It was incredibly difficult. Through a combination of self-teaching and a wonderful peer group, I have been able to make up for my lack of background in these areas,” says Lash. 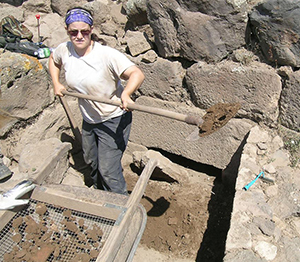 As a result of her efforts, she’s been able to dynamically change her dissertation topic and speak across the disciplines about climate change and archeology in ways that were not possible without both areas of study. Her research focuses on the physical responses to climate change in the countries surrounding the Western Mediterranean during the 1st millennium BCE examined through a political ecology lens. Through novel reconstructions, she asserts that local expressions of climate and environmental conditions are not merely a backdrop, but directly influence the colonial and cultural encounters that radically transformed rural settlement and agricultural production in the Western Mediterranean. She considers how environmental and economic risk was mitigated in a fragmented physical landscape and how vulnerable coastal lands were stabilized near the end of the era. Lash sees that her work can make a real world impact. As she explains, a great deal of demographic movement of people across the globe is happening today, but the subtle, long-term influences of environmental and climate change in this movement on land (and land-use) are not frequently studied. The people who feel the changes most acutely are often already marginalized and not in the position to fight for alternatives and think about long-term sustainability. Lash says her research is very personal; as a native Vermonter she grew up close to the land and has noticed changes over the years. “Environmental change can be easy to see, but it is much harder to communicate the relationships to climate, especially in the U.S., when it challenges individual’s basic ideologies,” says Lash. Additionally, increasingly more people are inside on computers and don’t feel as connected to the outside environment. Lash first considered the Open Grad program early on. She knew students in the first two cohorts who had made an impression. She lauds the program for giving her the support system of two groups of graduate students. She’s also seen the appreciation for what’s she studying grow, particularly in combination with the expansion of the Institute for Environment and Society on campus. More students in both her programs are thinking about research in a different way and are talking their own initiatives in a wide array of departments on campus. She’s excited that connections forged through the Open Grad program have encouraged graduate students and faculty from both sides to be more open to work that is interdisciplinary from its inception. As to what she wants to do after Brown, Lash says, “The repertoire of jobs I can apply for is greater, especially in shrinking academic markets. The combination has put me a good position in both the U.S. and abroad, where the tradition of this combination is more common.” She doesn’t hesitate to say that “fieldwork is where my heart is” as she thinks about future positions.